Dexter, Ethan, Reid and Trent are a great problem-solving team. In nine ninety-minute sessions, the conceived, designed and built a working drawbridge spanning 16 feet. Our last work session was like all those before it, but more so--collaborative, fun, focused and full of meaty problems to tackles together. When the last screw was driven, we had a working drawbridge. Pulley systems made raising and lowering the platforms very easy, and our precision in construction payed off--the two sections of the bridge meshed flawlessly. 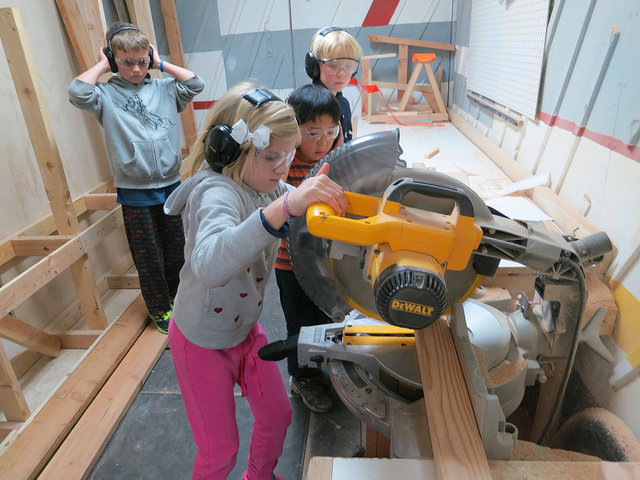 Many thanks to these four young builders--we can't wait to see what you guys do next! TodayWe were Makers-on-a-mission today. Reid, Trent and Ethan (Dex was out) had started in on the second drawbridge landing by 3:58, two minutes before the official start of class. This was our second-to-last session. Heady design work is mostly done, and we have a clear, large-but-doable list of construction and assembly tasks ahead. By the end of the day, we had two walkways, a pulley system, one landing completed, and one landing almost done. We have one session left to complete a working drawbridge. After three weeks of work, Jah-Amiel finished his go-kart today! 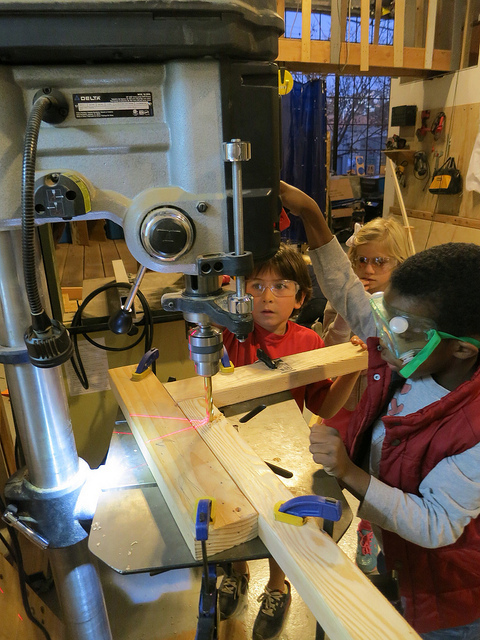 At six, he's one of our youngest makers, but has shown awesome focus and enjoyed helping hands from Bella, Ethan, Ruben and Quentin. When they tok his go-cart out for testing, class pretty much shut down for five minutes to savor the sweet (pushed) ride and tight turning radius. Minette and Kielson continued throwing bold tempera on their framing stud sculptures, while Lincoln, Sawyer and Ethan started on a wall, a stool and a desk (respectively). Finishing the Landing and Attaching the Footpath! We began today by splitting into two groups: Ethan and Dexter finished blocking the landing (the part of the drawbridge that does not move) while Sean and Trent built the landing's bottom rim and vertical posts. We assembled the landing and--it fit! Can't say enough about the precision required to build a thing in modules, then have those modules actually fit together! Then we attached the footpath (the part that draws up and down) to the deck--another great mate! With the last moments of class we started in the pulley system that will raise and lower the footpath. We started the session by finishing the second drawbridge platform. Carpentry, for our older, more experienced team, is fairly easy. Planning exactly what we're going to build, however, is hard. Said another way, drills and chop saws are straightforward, and tell us exactly how to use them. Pencils and paper ask more of us and our imagination. We drew possibilities for our drawbridge's towers for a solid fifteen minutes--a huge amount of sustained focus. We've realized the chain of dependent events in construction, and have drawn the elements up next in greatest detail, with increasing room for flexibility/response to emerging problems down the road. 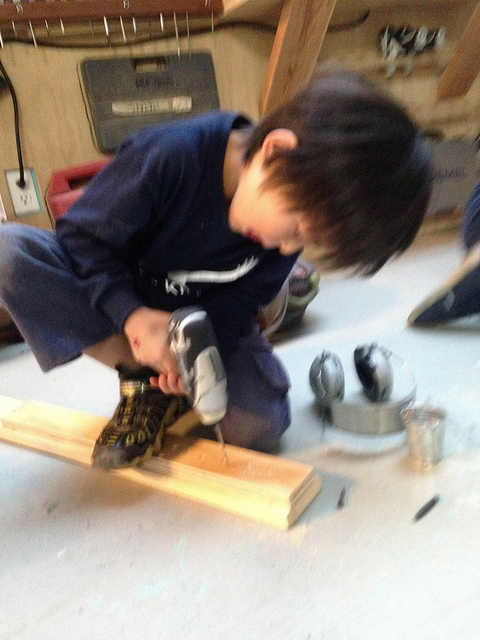 Class continued apace with our young builders continuing their explorations of axles. We started class witha few minutes of team bubble-wrap popping (just for fun). 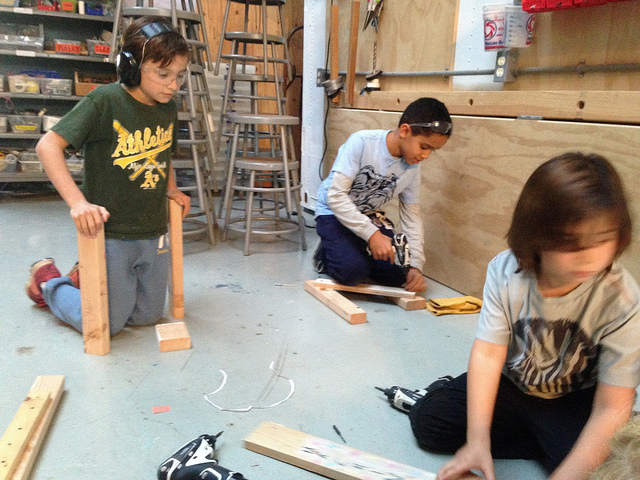 This last photo says a lot about the atmosphere here at Tinkering School, and the things that are even more important than building cool stuff. Nathan and Hugo are friends, frequent collaborators and veteran tinkerers. Last week, they set out to spell out their names in wood. This afternoon, Nathan was unable to come to the shop. So his buddy, Hugo, worked not just on his name, but on his absent friend's name, as well. Dexter, Ethan and Reid began work on a drawbridge today (Trent couldn't make it). The "Seniors" class began the project with lots of forethought and drawing. It was great to see so much respect for the task ahead. We got in a solid 30 minutes of fabrication on the first platform, and hope to complete both platforms next session.